It has been a very busy week for Spanish fast-fashion giant Zara, starting with the presentation of its first skiwear capsule collection, signalling Zara’s intent to enter the outerwear segment. 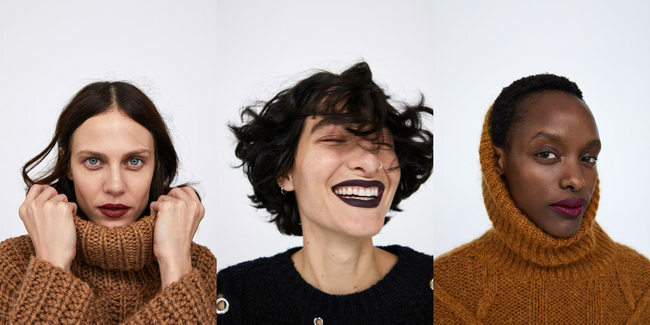 And now it’s the turn of cosmetics, the next step in the drive to diversify the brand’s product range: on December 5, Zara will be launching its first lipstick collection. The Inditex group’s main brand never uses traditional communication tools, like advertising campaigns or social media influencers to present its novelties. Over the years, Zara has relied on a network of imposing flagship stores in strategic locations, and on well-orchestrated campaigns with celebrity models and prestigious photographers. Zara’s aesthetic level is on par with that of a fashion magazine, and it isn’t simply designed to improve the customers’ online shopping experience, but it ensures the brand’s visibility in-store and in the media. Zara is now introducing Zara Ultimatte, its first lipstick collection. “Inspired by the kind of make-up needed to create ad campaigns,” the line was developed starting from the colours of the Autumn/Winter 2018-19 campaign by renowned British make-up artist Pat McGrath, famous for her work with labels like Christian Dior and Armani Beauty. The new Zara collection was designed in Los Angeles and produced in France. It features 12 high-pigment lipsticks, eight liquid matte lipsticks, a box kit with three red colours and a limited-edition, behind-the-scenes kit. The prices range from €7.95 to €19.95, and the collection is available worldwide and online only. With this launch, Zara confirms the group’s intention to extend beyond the world of apparel and to establish itself in cosmetics and fragrances. Bershka and Pull&Bear already have their own make-up lines, targeting a younger clientèle. Making the lipsticks available exclusively online is part of Inditex’s strategy of developing products reserved for e-tail only, a channel the group is planning to expand for all of its brands worldwide by 2020. Zara leads the group in this respect, as its websites already serve 155 countries. Business-wise, Zara is still the group's top earner, generating a revenue of €7.910 billion in the first half of 2018.